Terrell Owens has been one of the NFL’s best big play wide receivers of the past decade. T.O. has produced on three different National Football League teams, including the San Francisco 49ers, Philadelphia Eagles and Dallas Cowboys. More importantly in our case, Terrell Owens has produced for tens of thousands of fantasy football teams across America. Despite occasional nagging injuries through the first part of this decade, TO has remained one of the most consistent fantasy wide receivers on the landscape. He is a perennial high round selection, despite his controversial nature. No season was more controversial than the 2005 NFL Season, when Terrell Owens was suspended from the Philadelphia Eagles roster about 6 games into the season — thus destroying many fantasy teams in the process. Many fantasy owners that had T.O. in the 2005 season swore they would never draft him again. I did the same thing, though I broke down and drafted him onto a team last year (2007). What can I say; he’s just that good. Whatever your stance on Terrell Owens, he’s a major factor in any fantasy football format. The 6’4" receiver catches a lot of balls, has loads of yards after the catch, and scores touchdowns at a pace rivaled by few other fantasy wideouts. T.O. was born Terrell Eldorado Owens in the state of Alabama. Owens’ grandmother forbade him from playing football growing up, but he was a track and basketball star. In college, he played all three sports, and even made a trip to the NCAA March Madness tournament with the Tennessee-Chatanooga squad. Terrell Owens became a starter at wide receiver in his sophomore season for the Mocs, and he was a star player by the end of the year. After another stellar junior season, Owens had a relatively disappointing senior year — when opponents targeted him with doubleteams. Terrell Owens was seen by NFL teams as a physical specimen and great athlete, but a raw football player who would need a lot of coaching. His 40-time was sub-par for NFL wide receivers and Owens slid into the 3rd round of the draft, while Keyshawn Johnson and Marvin Harrison were 1st rounders in the same draft. The San Francisco 49ers eventually drafted T.O. Owens learned the craft of being a wide receiver under Jerry Rice, his childhood idol. Rice also taught Terrell Owens the value of training. Terrell Owens went on to beat out J.J. Stokes (who was drafted 7th overall) as the Niners’ #2 receiver across from Jerry Rice, though questions lingered about Owens’ hands. This was underscored by Terrell Owens up-and-down game against the Green Bay Packers in one NFC playoff game, when Owens appeared to be the goat of the game after dropping four passes. T.O. eventually came through in the clutch, catching the game-winning touchdown pass from Steve Young in traffic with less than half-a-minute left in the ball game. By then, Terrell Owens had acquired the nickname "T.O." John Madden bestowed the name, apparently because he couldn’t choose between two different phonetic interpretations of the name "Terrell". Madden’s face-saving nickname has become one of the most recognizable monikers in football today. In his time with the San Francisco 49ers, Terrell Owens gained a name as a perennial fantasy stud. He also gained a reputation for flamboyance (such as the Sharpie Incident and the celebration on the star at Texas Stadium) and petulance (calling out Jeff Garcia, screaming at his offensive coordinator in front of the cameras). As the Forty-Niners went from NFC contender to NFL also-ran, Owens’ behavior became more difficult for the Niners to stomach. In the 2004 offseason, the Niners had had enough, and were happy to see him leave in free agency. Terrell Owens ended up with the Philadelphia Eagles, though he almost landed with the Baltimore Ravens. 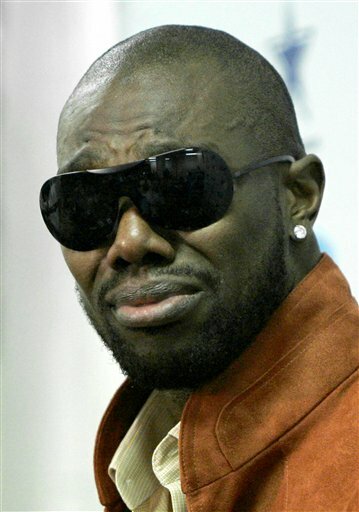 After insulting the Ravens franchise after they attempted to trade for him, T.O. went on to have one of his best fantasy football regular seasons yet. Fantasy owners were disappointed when Owens was hurt late in the regular season on a Roy Williams tackle, and no doubt many teams lost in the playoffs due to the Terrell Owens injury. Owens returned for the Eagles appearance in the Super Bowl, and he played huge in the biggest game of his life — ending with 10 receptions. The Eagles still lost to the New England Patriots. The 2005 season started out bad for Terrell Owens, as he began to complain about his 1-year old contract with the Philadelphia Eagles. Next, he began to criticize Eagles star quarterback, Donovon McNabb, much in the same way he did Jeff Garcia. Finally, Owens had a fight with Hugh Douglas, a former Eagles player, and later complained of a phantom injury sustained in an Eagles victory. Andy Reid and the Eagles front office, exasperated by Terrell Owens’ antics, suspended him for the season. A tumultuous offseason (and borderline crazy press conference, thanks to agent Drew Rosenhaus) later found Terrell Owens joining forces with Jerry Jones and the Dallas Cowboys. Owens fought through a hamstring injury in preseason, which many questioned the severity of. Dallas head coach Bill Parcells appeared to be one of the many, and a rift seemed to form between Owens and his coach, especially when Parcells refused to refer to Owens by name in his press conferences. Terrell Owens had another huge fantasy football season (leading the NFL in touchdown receptions), though Dallas Cowboys fans heaped abuse on Owens. Apparently due to a finger injury, Owens also led the league in drops, including a couple of drops that may have cost Cowboys key NFC East contests (Washington Redskins, New York Giants). The 2007 season was a different story. Terrell Owens was significantly healthier, and he seemed to form a bond with Tony Romo in Romo’s first full season as Cowboys QB. The team went 13-3 and Owens had a better fantasy football season than his first with the Dallas Cowboys, though his season was overshadowed by the record-setting year of Randy Moss. Before you draft Terrell Owens, there are a couple of stats you should keep in mind. Terrell Owens had 10+ TDs last year, but he only had 2 games with 100 yards. In fact, 8 of his 16 games last year, Terrell Owens had 40 or less yards receiving. The Dallas Cowboys didn’t cut T.O. purely because of locker room concerns. At 35, Owens is starting to show signs that he’s slipping – significantly. Only the 10 Tds obscure the fact of how far he fell last year. One Dallas Cowboys insider studied the film of Terrell Owens last year. To start the season, opposing defenses were double-teaming T.O. about 19 plays a game – more than half of the Cowboys’ passing downs. By the end of the season, opposing defenses were only double-teaming Terrell Owens 7 plays per game. In other words, the word was out that Terrell Owens could be shut down with one cornerback last year. Even more concerning for Terrell Owens fantasy owners, the word was that you could press cover TO at the line of scrimmage and jam him at the line. Now, I could see if you could cover Terrell Owens with speed and quickness, since T.O. was never a blazing speedster. But when a chiseled workout freak can be outmuscled at the line of scrimmage by smaller corners, that’s a sign that Terrell Owens is fast dropping out of the elite receiver category. Combine that with the fact that Trent Edwards is significantly less of a passing threat than T.O.’s three former QBs – Jeff Garcia, Donovan McNabb and Tony Romo – and I see Terrell Owens have a significant dip in the numbers department this year. Remember, touchdown totals are the most up-and-down stats category for receivers. They reflect greater deviations than passing yards and overall receptions. Sure, T.O. has been terrifically consistent in an inconsistent stat (TD receptions), but age is eventually going to catch up. If you look inside the numbers, age might already have. Terrell Owens appears to have found a home in his third year with the Dallas Cowboys. It has been a season since he’s had a major outburst, apparently because he likes Tony Romo and Jerry Jones. Terrell Owens is a huge part of a Dallas Cowboys offense which has been Top 5 in the NFL the last two seasons and appears to be a monster again this year. There’s question marks on the offense this year, including who will be the #2 receiver across from Terrell Owens. Terry Glenn and Patrick Crayton appear to be the likeliest candidates. The main other receiving threat will be Jason Witten, though. Marion Barber takes over the Cowboys running game, though there is a question if the punishing running back can be the every-down ball carrier the Cowboys need. Felix Jones could Barber a significant amount of time. There are also questions about Owens’ age and nagging injuries. Now reaching his mid-thirties, this is the age when receivers begin to lose a step and the injuries begin to pile up. Terrell Owens appears to be a freak of nature, and it’s important to remember that he learned training techniques from Jerry Rice — who played until he was 40. 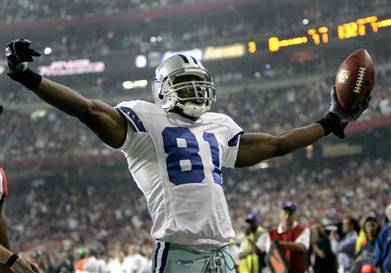 If the Dallas Cowboys are going anywhere — and most people believe they will — Terrell Owens will be a huge part of that. If that’s the case, then T.O. should post huge fantasy numbers in 2008. Tony Romo is certain to throw the ball to Terrell Owens well over a hundred times this year, so barring any major injury, I see Terrell Owens putting up Top 5 fantasy receiver number at least one more year.